Welcome to Family Game Month! For our first giveaway, we have the Monopoly Deal Card Game. Get ready to become addicted, because the Monopoly Deal Card Game has to be one of the most addicting games out there. In a nutshell, the person who collects three property sets first wins the game. Just like in regular Monopoly there are opportunities to collect rent, pass GO and put houses and hotels on your properties, but each with a little twist. There are also "deal" cards in the deck that can change the course of the game in seconds. You can have a game with as few as two players, but if you want to play with six or more players, you'll need to shuffle two decks together and play as usual. Unlike regular Monopoly, this game will not go on for hours and hours, but you will become so addicted that you'll probably end up playing for hours and hours anyway. 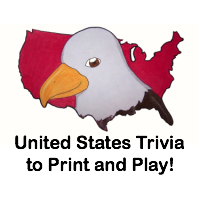 :-) This takes the fun of regular Monopoly and bumps it to a new level, so grab your kids (age 8 and up), your spouse and/or your best friends and get playing! 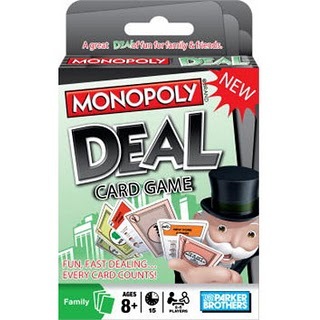 Win the Monopoly Deal Card Game! There will be 3 winners!! First, you need to publicly follow this blog and/or subscribe on Google Reader. Then comment here and tell me who you would play this game with. 10) Get an unlimited number of additional entries for entering other The Twinners giveaways (1 additional entry per CURRENT OPEN giveaway, and make sure to leave a separate comment for each giveaway). This giveaway will close on April 17, 2010 at midnight. I would play with my husband. My daughter is still a little young for this right now. I followed you on Twitter - amberjordan. I'm in your Samsung give away too. I entered your Harold book contest too. I follow your blog. I would play with my husband mostly. Occasionally my husband and I would play with my mother and/or a friend. I follow you via Twitter. My screenname is SmtmsAlwys. I'm wondering if you would be interested in participating in my Mom Blogger Contest for $100 Cash prize during the month of April for MissTutu.com? I entered your Memory Game giveaway. I follow and I'd play this with my nieces. I would play this with my son. He loves playing games. follow your blog & I would play with my fiance, who loves monopoly anything. Follow you publicly via Google Friend Connect. My daughter would love this. I would play this game with my hubby and his family! I added your button onto my blog sidebar! I voted for you blog on THE MOST POPULAR MOM BLOGS! I'VE VOTED FOR YOU ON I AM A MOMMY BLOGGER! Public follower & I'd like to play this with Logan! i would play this game with my husband. I would play this with my boys - I follow you on google!